Westhaven B&B is a relaxing home-from-home located on the romantic shores of loch linnhe with stunning views of the Ardgour Hills. Westhaven offers excellent spacious accommodation and is about 2 miles from the centre of the historic town of Fort William. Fort William is an ideal base for anyone touring the Highlands. It has many outdoor activities to offer, there is sailing, fishing, golf, walking, cycling horse riding and not to forget climbing Ben Nevis (Britain’s highest mountain).You can take a boat trip on Loch Linnhe and see the Seals. We offer packed lunches, laundry service (wash and dry), iron and ironing board are available on request , taxi service, pick up at airports or train stations (by arrangement). We are here to make everything as easy and enjoyable to your stay. We offer good hearty breakfast served in our dining room, which has magnificent views of the Loch and surrounding Hills. We cater for vegetarian, vegan, nut or gluten free. Early breakfast is available from 7.30 am (by arrangement) or packed breakfast for early checkout. We have secure parking at the rear of the house and lockable storage for cycles and outdoor equipment. Our spacious bedrooms are tastefully decorated to make your stay as comfortable as possible. 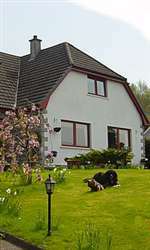 We provide all the facilities would expect of a 4 star bed and breakfast. We have doubles, twin, single and family rooms. We have four rooms en-suite and one single with private bathroom (not shared) all with loch views. There is a comfortable, spacious lounge, again with loch views, available for guests to relax in the evening.